Gross margin for the quarter was 40.0 percent, compared to 40.3 percent in the year-ago quarter, and international sales accounted for 60 percent of revenue. Apple's quarterly profit and revenue were both company records for the September quarter. Apple also declared another dividend payment of $2.65 per share payable on November 15 to shareholders as of the close of trading on November 12. The company now had $124.25 billion in cash and marketable securities. Apple's guidance for the first quarter of fiscal 2013 includes expected revenue of $52 billion and earnings per diluted share of $11.75. 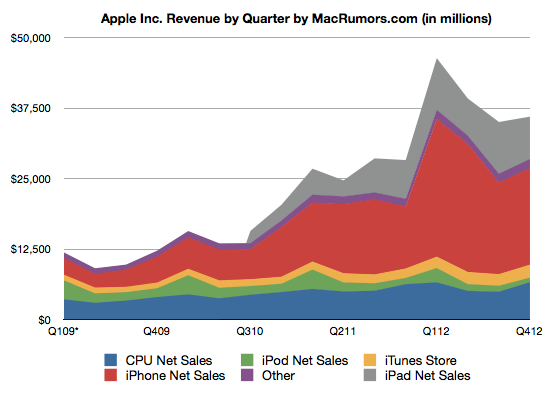 - New September quarter records for iPhone, iPad and Mac unit sales. Highest Sept quarter revenue and profit ever. - Sold 4.9 million Macs, 1% growth year over year compared to IDC estimates of 8% contraction of global computer market. - Portables make up 80% of Mac unit mix, highest ever. - 3-4 weeks of Mac channel inventory, off from 4-5 weeks of preferred. - iPod share is 70%+ of market, still top mp3 player in most countries. - iTunes Store produced record results of $2.1 billion. - New iTunes launching soon. - 58% year over year growth of iPhones, versus 35% for smartphone market over the quarter. - Demand for iPhone 5 continues to outstrip supply. - 9.1 million iPhones in channel inventory, up 800k from last week. Below target 4-6 weeks of iPhone channel inventory. - Touting how Canon and Amtrak use the iPhone, as well as reporters from BBC, CTV and the Wall Street Journal. - iPad sales were ahead of Apple's internal expectations. Strong year over year growth across all geographies. - Talking about enterprise companies using iPad including Volkswagen (more than 30 internal iPad apps). - Sold 44 million iOS devices in September quarter. - New quarterly record for app sales. - Made a number of improvements to Maps in the past month, won't stop improving. - $4.2 billion for Retail stores. Up 18% year over year. Store's best iPhone launch ever. New quarterly record for Mac sales, moving 1.1 million Macs. 18 new stores in 10 countries including 1st store in Sweden. 390 stores total. 94 million visitors vs 77.5 million last year. 19,000 visitors per store per week. - Tax rate of 25.2% for fiscal 2012. - Cash of $121.3 billion at end of the quarter, up $4 billion from prior quarter. - Paid $2.5 billion in cash dividend in August. - $2.65 / share dividend comes out in November. - Entered share repurchase program, may also repurchase shares in open market share transactions. - Strongest product pipeline ever. Q: If your guidance comes to fruition, this will be the first time Apple EPS drops year over year. Bears will point out that company's price premium or supply chain advantage is weakening. Can you comment? What's gross margin downtick in December caused by? A: Change YoY driven by a few things: last year, had 14-week quarter. Stronger US dollar and change in gross margin causes as well. This is most prolific product period in Apple's history. Unprecedented number of new product introductions. Record levels of demand. 80% of our total expected December quarter revenue was just updated. iPhone 5, iPad Mini, iMac, iPod Touch, iPod Nano and MacBook Pro 13" Retina have brand new form factors. All products have higher costs than predecessors and lower gross margins and all are at the top of their cost curve. Sheer number of new products in short period of time affects gross margin. iPhone 4 and iPhone 4S prices drop too. iPad Mini is priced aggressively at $329 for incredible value. Gross margin is significantly lower than corporate average. Margins lower because of iPhone 5, iPad Mini, iPhone 4 and 4S, transitionary costs associated with multiple new product ramps, high volume will have more deferred revenue relating to iCloud. Deferred amounts can be significantly higher than revenue amortized in from past sales. We're dedicated to making the best products in the world. We're unwilling to cut corners on customer experience. This is the reason our customers choose to buy our products. We're managing the company for the long run and will continue to make great long term decisions. We're confident in our strategy. Q: How are you thinking about supply ramp for the iPhone 5? How do challenges related to strong demand relate to past product launches? A: Demand for iPhone is extremely robust. We're thrilled with what we see. We are in a significant state of backlog right now. In terms of production, our output has improved significantly since earlier this month and I'm pleased with the progress we've made there. I'm pleased with the current level of output. This is the largest volume ramp in our history. Difficult to predict when supply and demand will balance. Feel confident in our ability to supply quite a few iPhones. Q: Do you anticipate rolling out to all 100 countries as you announced at the time of the iPhone 5 announcement? Can you comment on whether the supply constraints have had a material impact on cost of goods sold? As the supply improves do you expect your cost of goods sold to decline? A: We still anticipate rolling out to 100 countries as announced, it is our fastest rollout ever. There will be some large countries in the month of December but we anticipate achieving the 100. In terms of cost, we see learning curves associated with ramping production. No exception here. But the difference is the sheer number of new products. Most prolific period in our history in terms of new product launches. Costs are associated with each of these. Don't see those costs accelerating on a per unit basis. See it being a production ramp across many new products. Q: Do you see the iPad getting bigger and taking on basic PC functionality? You see the tablet being bigger than PC market going forward, do you see bigger form factors being possible in the future? A: We don't comment on roadmaps and new products… we continue to be very confident that the tablet market will surpass the PC market. There is incredible development and ecosystems and products in the tablet space. It is already extremely compelling for many customer to choose a tablet, in particular an iPad over a PC. If you look at the size of the PC market, there is a huge opportunity there. 80-90 million PC's being sold each year. Our iPad mix will be extremely attractive offerings for people in lieu of PC's. We're going to continue to very much focus on the future of iPad and we're confident with what we have in the pipeline. We're extremely pleased to have launched iPad mini. Can't wait to begin selling it. Q: Can you talk about China? A: Mac up extremely strong, up 44%. Launched previously announced portables in June. iPad up 45% in Greater China, iPhone up 38%. A full year of Revenue in China of $23.8 billion, up $10 billion year over year, 78%. 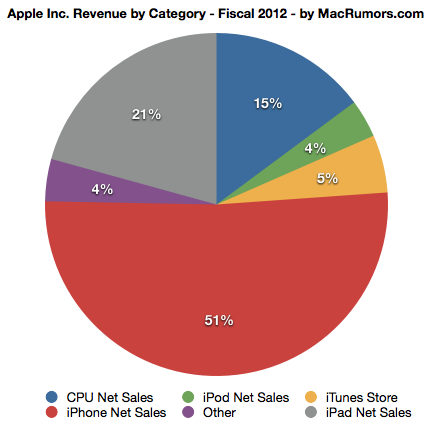 15% of Apple revenue for the fiscal year. Extremely happy with how we've done in China. Continuing to invest in our retail stores there. Expanding distribution with channel partners. Continue to see it as an extremely exciting market with more and more people wanting Apple products. Q: How do you think about the Win8 and Surface tablets? A: Haven't played with a Surface yet. What we're reading about it is that it's a fairly compromised, confusing product. One of the toughest things you do when making a product is to make hard tradeoffs. We've done that with the iPad and the user experience is incredible. You could design a car that flies and floats, but I don't think it would do those things very well. People look at the iPad and competitive offerings, I think they conclude the iPad is the better choice. Q: How do you think the iPad mini will sell versus the original iPad format? Is there more of an ebook focus, or will it sell more than the iPad? How do we think about the cannibalization of the older form factor? A: We provide a fantastic iPod Touch; an incredible 4th gen iPad, an iPad Mini and an iPad 2. Customers will decide which ones they want to buy. We've learned not to worry about cannibalization of our own products. Better for us to do it than for someone else to. The bigger opportunity here is the 80-90 million PC's sold per quarter. 300 million PC's bought per year. I think a great number of those people would be much better off buying an iPad or a Mac. That's the bigger opportunity for Apple. Enormous incremental opportunity. Q: How's the Apple TV hobby going? A: For Q4 we sold 1.3 million Apple TV's, up more than 100% YoY. Sold more than 5 million Apple TV's during the fiscal year, more than double the previous year. Business doing very well, but looking at revenue of the business, it's quite small compared to the business as a whole. It's a beloved hobby though. We continue to pull the string to see where it takes us. Q: Anything in the September quarter that slowed iPad purchases? A: June to September was 17 million to 14 million. First thing to note is that the June quarter contained 1.2 million increase in channel inventory. Actual sell-through sequentially looks very different than our reported sell-in numbers. Second thing is that the 14 million exceeded what we had expected to do in iPad. The reason we expected it to decline was that we believed is that normally we would see a seasonal reduction in the Sept quarter versus the June quarter. Part of this reason is because K-12 heavily buys in the June quarter. K-12 doesn't buy much in September. Higher ed is still buying notebooks. Normal seasonal that's exaggerated further when we announce a new product in March. Have an enormous quarter of demand in the June quarter. In addition, customers delay purchases of tablets due to new product rumors. These intensified in August and September. Some was anticipated but some we wished wouldn't occur but it did. On a year over year basis, having a channel inventory build as we stocked the channel to the product level, the sell-through grew 44%. Underlying sell-through was extremely strong. We feel great about how iPad has done. We think it's going to be an incredible holiday season. Q: As these products get more expensive, would you be open to pass these costs onto your customers? Would your prices rise over the years? A: We don't guide past the current quarter, won't talk about what we'd do after that. Q: 44% up guidance for revenue, how can we think about the iPhone and iPad families dovetail with that 44%? A: You're asking the sequential questions and if you're looking at this year over year and comparing the sequentials year over year. Don't forget about the 14th week last year. Specific to your question, we just announced amazing new products in both lineups, we expect large sequential increases from Sept to Dec. As a result, we're thrilled to be providing guidance for $52 billion of revenue. Q: What is the approach for the iPhone rollout? Is it to rollout to 100 countries and have supply constraints across 100 countries? Or will you reach supply demand balance in some countries and constrain other countries? A: We planned the first 30-40 countries prior to introducing the product. Rolled those out across September in two chunks. Balance of the quarter, we planned with an eye towards the supply and what we think demand will be. We do plan these in advance. It is not a precise science. Obviously have to plan those with several weeks of notice. Occasionally it can be different than what we think. Q: Can you talk about your pricing philosophy on the iPad Mini? A: When we set out to build it, we didn't set out to build a small, cheap tablet. We set out to build a smaller iPad that offered the full iPad experience. The difference between us and the competition is profound. 35% larger screen than 7" tablets. 2 great cameras. Fastest communications with dual bank Wi-Fi. Fit and finish of our precision enclosure is breathtaking when held in your hands. That's what we've done, the iPad mini has higher costs and gross margin is significantly below our corporate average. Height of the cost curve, but we want to make a large number and we're going to work to try to get down the cost curve and get more efficient with manufacturing as we've done with our other products. Q: What about enterprise with the iPad mini? A: Most Fortune and Global 500 companies are using iPad. We're doing fairly well there, clearly much more to do but I'm feeling pretty good about it. Q: Comment on component environment? Where are the constraints as you're launching? A: In terms of iPad and iPhone, I don't see a component shortage gating us for the quarter in the numbers that we've given you in the guidance. We've solved some challenges there and feel good about our position. In terms of general shortages, we'll be constrained on the iMac for the full quarter in a significant way. Part of that is that we begin shipping 21.5" in November and 27" in December. There will be a short amount of time in the quarter to manufacture those and ramp those. Demand should be robust and we'll have a significant shortage. Other shortages are related to demand. We're extremely bullish on demand with the revenue guidance. Foreign exchange hedging was higher than expensive, dollar weakness late in the quarter and accounting rules affected future quarter hedges in the current quarter. All things being equal, premium expense in Q1 should be lower. Q: iPhone unit growth versus revenue growth has been similar over quarters. For the iPad, this has changed. Is this the market migrating down to the lower end of the SKU stack? A: iPhone ASP was relatively flat in September quarter. iPad ASPs were down year over year in a low double digit way. This really was reflective of the price reduction on the iPad 2 and the stronger dollar and a slight change in mix. That's what drove iPad ASP change. On a sequential basis, iPad ASP's were pretty flat. Q: Second quarter in a row that US iPhone activations were growing faster than international. A: Important to remember that we launched iPhone 5 in the US during the quarter and we launched in some international countries but did not launch in the bulk of the world. Would have expected a more significant growth in the US than the rest of the world. Q: Will iPhone 5 launch in mainland China occur in December? A: We expect it will. Q: You think you will be able to meet supply of iPhone's by the end of the quarter? Or will you end the quarter with backlog orders? A: Not projecting whether we'll balance for the quarter. We feel great for where we are on the manufacturing ramp and our supply output is significantly higher than it was in October. We should be able to supply quite a few during the quarter. As far as when that balance occurs, we can't tell. Demand is very robust. Q: Regarding the iPad, the emerging model in the tablet space where makers are subsidizing hardware in terms of content, how is that impacting the iPad business and is that something Apple would consider going forward? A: We've seen low cost challengers before. iPad continues to beat every other tablet on the market at any price. Customers are smart, they have high expectations. They want a device that can do more. We're confident that our focus on making the best product is what will win in the end. We will stay true to that. Q: Sounds like you've made changes to your supplier list. Is that adding a layer of complexity to these product launches? A: Not sure what you're trying to get at there, I would not say that there has been a significant change in our supplier partners. There's always some change, obviously, but I wouldn't describe it as significant. There hasn't been a change that would have driven more cost. Q: Asking about Samsung and LCD. A: No change there driving cost. We continue to be a customer of Samsung. Continue to have a commercial relationship. Q: Fair amount of debate within Apple over the past few years about smaller iPad. Why decide now that the time is right for a smaller iPad? Spoken about higher cost structures in moving from 3GS to 4 and in the end the scale that Apple is building, the component reuse, you've got through gross margin dips. Anything structurally different this time around? A: Comments that Steve had made before about 7" tablets, we would not make a 7" tablet. We don't think they're good products and we would never make one. The difference in the real estate size between 7.9" and 7" is 35%. When you look at usable area, the difference is greater than that. from 50-67%. The iPad mini has the same number of pixels as the iPad 2. You have access to all 275,000 apps that are in our App Store that have been designed to take advantage of the full canvas. iPad mini is a fantastic product and isn't a compromised product like the 7" tablets. It's in a whole different league. Regarding sequential decline in gross margin, largely driven by many new form factor changes and some price reductions that we've taken. We believe that over 80% of our revenue will come from newly introduced products. Lower gross margin on a new product is not something that's new for us. Sheer number of new products that we've introduced in the last 6 weeks, we haven't had that magnitude in the past. Nothing structurally different. Big focus on wanting to make a lot of these products to get them in customers hands. Will also work to get down the cost curves. No change in what we're working on. Plus it's kind of depressing to see that a computer company barely sells any computers anymore looking at that chart. Then when the iPhone is no longer popular, what will happen to Apple then? What makes you think the iPhone will become unpopular anytime soon considering it is gaining popularity each year? Blah blah blah we made a crap-tonne of money and we're awesome. Thank you and Goodnight. Apple dropped "Computers" from their name years ago. earnings missed expectations as did iphone sales. er, *whose* expectations? "analysts"? the same analysts who have been armchairing apples every move and largely blowing it...hmm yeah not so concerned w/ them. I would pay so much money to watch Tim Cook do this just once.